I set out to write about the cars I’ve had over the past 35 years, but 4000 words later, I ended up writing about the many fond memories I’ve had around car ownership and life in general. This is part 6. 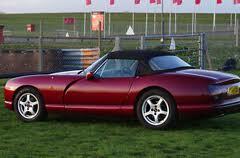 One day I stumbled across a very nice TVR Chimaera. I’d heard of the TVR brand, more from a poor reliability perspective, but I’d never really seen one up close and I’d never driven one before. It was sitting in the sun when I arrived, it was deep metallic red with a camel leather interior and it looked fabulous. When the guy fired up the 4.0L Rover V8 engine it sounded even better than it looked and I knew there and then I had to have it. It’s hard to describe the feeling of driving a TVR it’s like nothing else I’d driven before or since. So much power and torque and so little weight means that when you press the loud pedal it takes off like a rocket and you just hold on with a huge grin on your face. Yes it was a bit eccentric, but that just added to the appeal. To this day, my TVR (Red V8) got more love and attention than any car I’ve ever owned. To say it was pampered would be an understatement. It was kept in a heated garage, it was washed and polished whether it was dirty or not, it only drank Shell Vpower, and it never went out in the rain or when there was salt on the road. I joined the TVR car club and enjoyed some excellent Sunday outings with 30 or so other TVR owners in the country roads of Northumberland and Yorkshire. These were planned with military precision and the routes were a closely guarded secret, as it had been known for the boys in blue to have mobile speed traps out waiting for us. Not that we ever exceeded the speed limit I hasten to add (cough). It didn’t live up to the billing of me getting the tools out again though. Yes I did some cosmetic jobs and I even reconditioned the chassis but I had the main dealer, before TVR went out of business, service it. My first service cost me something like £1200 and every year after that the annual service cost me the thick end of £1000, just as well I loved it then. The Touareg was reaching its third birthday and the TVR was being polished more and more but being driven less and less so I decided to sell both of them and buy something which had great performance but was more practical than the TVR.